The MUAA Board of Directors established this award in 1969. The criterion for the Award is distinguished professional achievement. The MUAA Board of Directors established this award in 1969. 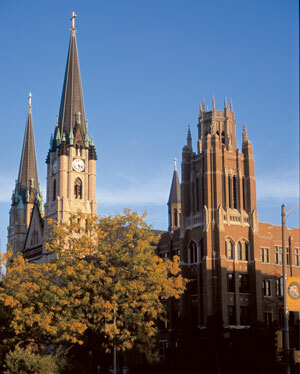 The criteria for the Service to Marquette Award are distinguished leadership and service to Marquette University. MUAA established the To The Community Service Award in 1979. The criterion is outstanding service to the community beyond Marquette University. Having received a Professional Achievement, Service to Marquette, To The Community Service or Spirit of Marquette Award is neither a requirement for, nor disqualification from, being considered for the Alumnus/a of the Year Award. Full-time University employees are not eligible for All-University Awards consideration. The Distinguished Alumnus/a of the year Award recognizes outstanding professional achievement and service to Marquette University or the larger community. The Young Alumnus/a of the year Award recognizes outstanding professional achievement before the age of 40. The Distinguished Alumnus/a of the year Award recognizes outstanding professional achievement and service to Marquette or the larger community. The Service Award recognizes outstanding service to Marquette University, the College of Business Administration or the community beyond Marquette University. The By-Line Award honors an alumnus/a who has attained distinction in journalism and related fields. The Young Alumnus/a of the year Award honors significant professional achievement, personal responsibility, technical excellence and/or service to the university or community before the age of 40. The Distinguished Alumnus/a of the year Award honors distinguished educational achievement and leadership in care for knowledge, care for profession, and care for person after the age of 35. The Young Alumnus/a of the year Award recognizes an alumnus/a under the age of 40 who demonstrates significant educational achievement and potential in care for knowledge, care for profession and care for person. The Distinguished Alumnus/a of the year Award recognizes outstanding professional achievement and service to Marquette. The Distinguished Alumnus/a of the year Award recognizes outstanding professional achievement and service to Marquette University and/or the larger community. The Service Award recognizes outstanding service to the community. The Young Alumnus/a of the year Award honors professional achievement under the age of 40. The Young Alumnus/a of the yearAward honors an alumnus/a who is a former athlete or former student athletic employee; who has demonstrated significant professional achievement, personal responsibility, excellence and/or service to the university or community before the age of forty.